We highlight many key findings and recommendations that can assist government leaders in understanding how best to leverage and scale past successes to benefit citizens and taxpayers today and in the future. The federal government can reduce costs while improving services by adapting private sector cost reduction strategies and technologies to achieve similar benefits in government. This objective is highlighted by a recent report, led by the Technology CEO Council (TCC), in which the IBM Center for The Business of Government participated. In “The Government We Need,” TCC members detail how, if implemented effectively, technology-based reforms could reduce federal costs by more than $1 trillion over the next decade. 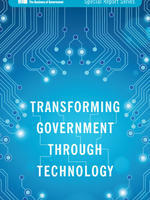 This special report, “Transforming Government Through Technology,” is a companion piece to the more detailed TCC report, and builds on a similar report released in 2010. We highlight many key findings and recommendations that can assist government leaders in understanding how best to leverage and scale past successes to benefit citizens and taxpayers today and in the future. These insights are reinforced by many of the Center’s past studies that similarly examine opportunities for improving government operations though a business-like approach. Driving change in the federal government requires more than new policies or the infusion of new technology; it requires a sustained focus on implementation to achieve positive and significant results. The practices and recommendations summarized in this special report provide a roadmap for government leaders to reach this objective.